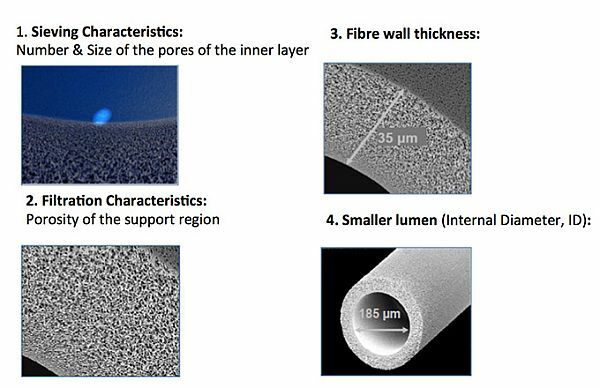 Following are the key characteristics which define the superior technology of TriTech membranes. Overview : The in-house R&D team based in Singapore, Tritech Water Technologies has developed the novel FO membrane. The TFC FO membrane has superior performance than current commercialized CTA FO membrane. Advantages : The main advantages of FO over current technologies used water reclamation includes lower energy requirement and lower membrane fouling propensity. FO overcomes fouling limitations inherent in pressure driven membrane separations allowing proper filtration and concentration of difficult products and waste streams. FO can process feed streams; a source of dirty or polluted water containing high levels of suspended solids. In separations driven by hydraulic pressure (such as RO) all components of a feed stream are unselectively forced against the membrane surface. In FO, osmotic pressure, which is hydraulic pressure created by Osmosis as water passes through a semi-permeable membrane into a more concentrated stream, selectively draws molecules through the membrane avoiding membrane fouling and compaction. FO is a process normally occurring in nature that, when harnessed for water filtration and liquid transfer, requires little or no electricity or external power source.